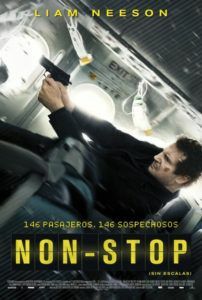 Non-Stop is fast-food cinema. Like a trip to Taco Bell (or any fast-food chain, for that matter), it seems like a good idea at the time, but even before the last bite goes down you regret the decision and spend the next few hours groaning with an upset stomach. Reteaming with his Unknown director Jaume Collet-Serra, Liam Neeson retains his post-Taken action hero status in a slow-burning murder mystery set on a plane. The film’s writers (John W. Richardson, Chris Roach and Ryan Engle) perpetuate an increasingly implausible series of events and, because of the claustrophobic setting and limited number of suspects on the flight, they write themselves into a tight corner from which their sloppy third act cannot hope to escape in a satisfying way. The cast of recognizable supporting players and Neeson’s imposing presence make Non-Stop watchable and, at least in the first half, rather enjoyable. But the overwhelmingly convoluted resolution leaves the experience barely worthy of a guilty pleasure label. Neeson plays Bill Marks, the Federal Air Marshal on an Aquabritish flight from New York to London. Unkempt and evidently an alcoholic, Bill is a mess, and given his fear of flying it’s easy to question why he’s allowed on a plane with a gun. Seated next to the loquacious passenger Jen (Julianne Moore), Bill begins to receive anonymous text messages from someone who claims that every 20 minutes a passenger on his flight will die unless $150 million is transferred into a numbered bank account. Bill doubts its legitimacy but nevertheless informs his skeptical pilot (Linus Roache) and his fellow air marshal (Anson Mount, from Hell on Wheels) of the threat. Any disbelief is quashed after their time runs out and someone ends up dead. Worse, not only is the killer’s threat valid but they’ve staged these events to frame Bill at every turn: The bank account is in Bill’s name, he’s made to look like a murderer, and his reputation and sordid past don’t help clear his character. 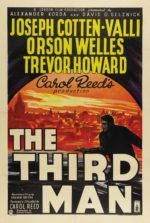 Although the paranoia and Wrong Man elements of this scenario are pure Hitchcock, there’s more of Agatha Christie in Non-Stop. It’s a whodunit in the sky, and there are suspects abound, with more colorful characters than a game of Clue. Who could it be? Could it be Moore’s flirty business class passenger or is she a red-headed herring? Is it the trusting flight attendant played by Downton Abbey’s Michelle Dockery? Or maybe it’s the token Muslim (Omar Metwally) who receives suspicious glances from his fellow passengers? Perhaps it’s the smarmy NYPD officer (House of Cards’ Corey Stoll), or the businessman (Nate Parker) whom Bill bumped into at the security gate. Could it be recent Oscar-winner Lupita Nyong’o (12 Years a Slave), who plays a flight attendant with only two or three lines of dialogue? Maybe it’s character actor Scoot McNairy (Killing Them Softly), here playing a guy with glasses. Then again, Bill might have split personality disorder and be wholly unaware that he’s killing passengers himself. Or maybe still, everyone on the plane is conspiring against him together à la Murder on the Orient Express. As the body count rises and the suspects are crossed off the list, we begin to realize that it doesn’t really matter who the killer is. At some point, we accept that it makes no difference at all. No matter how it ends, it will be someone we’ve suspected. After all, the writers had to pick someone. But, of course, the usual hyperbolic “non-stop thrill ride” is the thing, and the culprit isn’t immediately obvious. Neeson commands the screen, playing a grizzled, not very nice guy who, if portrayed by another actor, wouldn’t have been as sympathetic. And despite the impressive supporting cast, this is a one-man show in which Neeson gets violent with suspected passengers, writhes with frustration as Bill is reported as having hijacked the plane, and in one scene gives a ham-fisted speech to earn back the passengers’ trust. Another, lesser movie star wouldn’t have been able to pull off such scenes. Neeson, looking worn out from the last few years of action fodder, barely pulls it off himself. On the whole, Non-Stop provides a familiar set of circumstances for Neeson (that franchise unto himself) to exploit for box-office gold, while his director seems intent to deliver an experience designed for a drive-thru window. Collet-Serra has already wrapped principal photography on his third go-round with Neeson (Run All Night, due in 2015), and their collaborations will no doubt continue to payoff. In terms of his technical treatment, Collet-Serra is a graduate of the “Steven Soderbergh and David Fincher School of Color Filters” and applies what he’s learned without reservation or much thought. It’s a stylish if superficial approach in Collet-Serra’s hands, bringing visual texture but little substance. 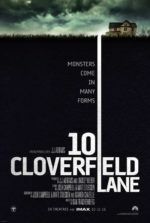 The director’s best film remains the underrated Orphan, and here he demonstrates the same confident aesthetic techniques as that title, though in a less memorable and affecting story. Claiming the production is on autopilot would be shameless given the setting, but it’s also very accurate.